Italy’s postwar election system, prior to 1991, was one of nearly pure proportional representation. In the Camera, deputies were chosen on the basis of open-list proportional representation through party lists chosen by party leaders in each of 32 electoral districts. In the Senato (Senate), voters would select senators in 237 single-member districts — but each individual needed a two-thirds supermajority to be elected directly. All other senators were determined through party lists on a regional basis. So despite the veneer of single-member district voting, the senatorial elections were also largely determined by a system of regional proportional representation. In June 1991, despite the lack of support from leading figures, Mario Segni and some members of the Italian Radical Party pushed through a referendum to repeal the open-list preference in Italian elections, which had largely resulted in a perpetual postwar government by the Christian Democrats (and their various allies, including the Italian Republican Party, the Italian Liberal Party, the Italian Democratic Socialist Party and the Italian Socialist Party that formed the five-party ‘pentitpartito‘ of the 1980s) to the perpetual exclusion of Italy’s main opposition party, the Italian Communist Party. Governments would rise and fall routinely — 61 governments in the 48 years of Italy’s so-called ‘First Republic’ — on the basis of factions within the Christian Democrats in alliance with the smaller parties with which the Christian Democrats governed. Despite efforts to downplay the referendum by key officials (former prime minister Bettino Craxi famously suggested it would be a good day for Italians to take a day trip to the seaside), it passed overwhelmingly on a vote of 95.6% to 4.4%. A subsequent referendum in April 1993 repealed the use of proportional representation in senatorial elections, again overwhelmingly adopted on a vote of 82.7% to 17.3%, opening the way for a new electoral law. It’s important to keep in mind that these changes happened at a time of massive change in Italian politics — so much so that the period from 1993 to the present has been called Italy’s Second Republic. The ‘mani pulite‘ (clean hands) investigation in 1992 resulted in the discovery of the ‘tangentopoli‘ (Bribesville) scandal that revealed widespread corruption at all levels of the government, and which ended with the dissolution of the long-governing Christian Democrats and all of their pentipartito allies. Meanwhile, the end of the Cold War meant that the long-suffering Italian Communists would start their transition from communist to a more social democratic party, culminating in the formation of the Democratic Party in 2007. As such, in many ways, you can view the push for electoral reforms in the early 1990s as part of a general movement to modernize Italy’s political system by nudging the country toward a more stable system with two large center-left and center-right parties. So from 1993 to 2005, Italian politics was conducted under a new plurality-based system, whereby 75% of the lower house’s seats were chosen in first-past-the-post districts, and just 25% were chosen by a fairly complicated proportional representation system (with a 4% threshold for winning seats). A similar 75/25 system was adopted for the Senato. But there’s really no indication that this period was any more stable: Berlusconi’s 1994 election resulted in a government that lasted barely seven months, mostly because of the demands of the autonomist Lega Nord (Northern League), and the centrosinistra (center-left) coalition that was elected in the 1996 elections went through four governments and three prime ministers. In 2005, in a move widely seen as an attempt to make the 2006 general elections more palatable for his coalition, Berlusconi introduced the current law, which provides that seats in the lower house are determined once again by proportional representation, but on a national level. The new law included the concept of coalitions — in the Camera, a coalition must win 10% of the total votes nationally in order to win seats, and each party within the coalition must win 2% in order to be allocated seats, while parties outside of coalitions that win at least 4% of the vote will also be eligible for allocated seats. That means there’s every incentive for small parties to join a major coalition — the hurdle for winning seats is accordingly much lower. Furthermore, as noted above, the winner gets a ‘bonus’ in that the coalition and/or party that wins the largest vote share wins at least 54% of the seats in the Camera. That combination was a great boost for Berlusconi: a proportional representation system would give voters the chance to vote for smaller parties with political brands less tainted than Berlusconi’s (which had become, even by 2005, tainted with scandal and sleaze allegations), but the formal inclusion of coalition-based mechanics and the ‘winner bonus’ could retain the general dichotomy of ‘left vs. right,’ hopefully forestalling a return to the dysfunctional system of the First Republic. In the Senato, each of Italy’s 20 regions elects its own senators. Again, seats are awarded solely on a regional proportional basis, but a coalition must win 20% of the vote in a region to win seats (and 3% for each individual party in the coalition), and a party outside of a coalition must win 8% of the regional vote. In each region, furthermore, the coalition (or party) that wins a plurality is automatically awarded at least 55% of that region’s seats. But because there’s no ‘winner bonus’ at the national level (just 20 smaller ‘bonuses’ at the regional level), there’s every possibility of what happened in last week’s elections — a hung Senato with no clear majority. In terms of stability, the center-left under Romano Prodi won the 2006 elections, but his government ultimately fell in 2008 — again, precisely because of his weak grasp in Italy’s upper house. Furthermore, the law has concentrated even more power in the hands of party leaders because under the post-2005 system, Italy features ‘closed list’ proportional representation — so Berlusconi’s party list in 2008 controversially included candidates such as Nicole Minetti, Berlusconi’s dental hygienist and Mara Carfagna, a former showgirl and ‘Miss Italy’ finalist. In France, presidential elections and parliamentary elections are both conducted via two rounds. In presidential elections, the top two candidates, regardless of their share of the vote, proceed to a runoff — that typically means the chief center-right candidate faces off against the chief center-left candidate, though not always. In the 2002 presidential election, Parti socialiste (PS, Socialist Party) candidate and prime minister Lionel Jospin was shut out of the runoff, which featured a landslide win by incumbent Jacques Chirac over far-right Front national (FN, National Front) candidate Jean-Marie Le Pen. In parliamentary elections, members of the 577-member Assemblée nationale are also chosen in two rounds, through single-member constituencies. In the first round, a candidate wins if he or she obtains at least 50% of the votes cast in the election on a turnout of at least 25% of all registered voters in the constituency. In reality, relatively few candidates win election after the first round — for example, in the recent June 2012 parliamentary elections, just 36 deputies won first-round election. In the second round, each candidate that wins at least 12.5% of registered voters in the first round (not just first-round votes) proceeds to a runoff. Given that France’s politics have for much of the Fifth Republic been dominated by two main parties, the Socialists and the center-right union — in its current iteration the Union pour un mouvement populaire (UMP, Movement for a Popular Movement) — that means most runoffs are a straightforward right-left contest, though the far left and the far-right Front national sometimes manage to make it into the runoffs. Again, for example, the second round of the June 2012 parliamentary runoffs featured 35 ‘triangulaires‘ (three-way runoffs) — it’s even conceivably possible for the system to result in ‘quadrangulaires‘ (four-way runoffs). How would a French system work in Italy? Proponents of a plurality system believe it will promote a more stable, two-party system in Italy, though as I’ve noted, it didn’t exactly make governments more stable from 1993 to 2005 (though it certainly made Italian politics more personality-based and pushed Italian politics toward a binary left/right face-off). Furthermore, in the 2006, 2008 and 2013 elections, we’ve seen the consolidation of the center-left and the center-right, despite the return of proportionality, due in part to the importance of electoral coalitions and the ‘winner bonus’ in the lower house. In the most recent election, of course, voters split four ways — among the centrosinistra, the centrodestra, Monti’s centrist coalition and Grillo’s movement. Pretend for a moment that Italy had conducted last week’s elections pursuant to the current French ‘parliamentary’ system — i.e., a two-round runoff system conducted in 630 single-member districts. Is it entirely clear that it would have resulted in any less gridlock than Italy faces today? Not necessarily. Although Monti’s coalition would have not likely made it into many runoffs, it certainly would have made it into at least a few in some northern Italian constituencies. Given the way that each of the other three groups split between 20% and 30% of the vote throughout Italy, however, it’s safe to say that the second round would have featured far more triangulaires (or would that be triangolares?). 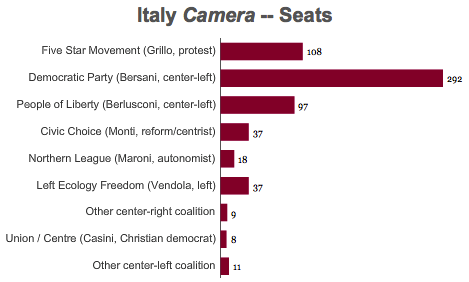 If anything, Italy might have ended up with an even messier result, a lower house with no clear majority. But what if Italy just adopted a more streamlined ‘French presidential’ runoff system, whereby the top two candidates in each constituency advanced to a second round? In each case, the three major groups would have been eliminated from so many potential runoffs that it would have been systemically difficult or even impossible for any one group to win an absolute majority of seats in either house. So it’s not clear that the French system — either a ‘presidential style’ top-two runoff or a more involved ‘parliamentary style’ runoff — would necessarily make Italian governance more stable, and it might well have made things even chaotic. The fact that the French system results in two-party stability lies largely in the fact that French voters have consistently voted in large numbers for the center-right and Socialists over the past 55 years of its Fifth Republic. If Marine Le Pen and the Front national or, say, Jean-Luc Mélenchon and the far left posted the same kind of voter support in France’s 2012 parliamentary elections as Grillo’s Five Star Movement did last week in Italy, France would probably have had a hung parliament as well. There are, however, additional benefits in moving back to a plurality system — and the elimination of closed party lists is chief among them, as Frattini himself noted Tuesday. Under a plurality system, instead of voting for a national party whose leaders decide who enters parliament, Italians would not only choose representatives directly, but would choose legislators who are dependent upon a discrete set of local voters in a given constituency for reelection. That’s more representative, of course, and more small-d democratic, but it could also reduce party discipline. So there are many rationales to changing Italy’s election law — fostering ‘stability’ and incentivizing a two-party system, making the Camera and Senato systems more parallel, making lawmakers more responsible to constituents, or making the parliamentary results more reflective of actual voting results. In each case, though, the French system — or any system — may do a better or worse job of achieving any of those goals. It’s not clear, in any, case whether Grillo, Berlusconi or Bersani agree on the rationale for any new electoral laws. 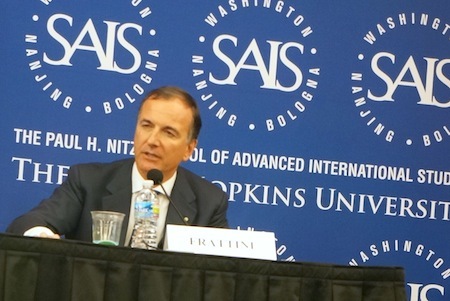 Frattini served as foreign minister in Berlusconi’s government from 2002 to 2004 and again from 20o8 to 2011. From 2004 to 2008, he was Italy’s commissioner at the European Commission, where he covered the justice, freedom and security brief. Frattini got his start in Italian politics in Craxi’s Socialist Party in the 1970s and 1980s, which was at the heart of power in alliance with the Christian Democrats in the mid-1980s. Although he has always been one of Berlusconi’s most loyal (and effective) lieutenants, Frattini’s always been very much a moderate, and he was long been considered by European leaders to be one of the more responsible center-right leaders in Italy. He was one of the most pro-Monti members of the PdL when the Monti government came to power in November 2011 and in advance of the 2013 general election, he even flirted with the idea of running for parliament on Monti’s ticket, although he ultimately decided not to stand for either the PdL or Monti’s coalition. Although he indicated previously that a ‘Berlusconi-Bersani’ grand coalition might be the most stable option, Frattini on Tuesday thought that was an unlikely result. He also cautioned that the protest vote in the recent election was essentially 50% of all voters — including not only the 25% of voters who actively supported Grillo’s movement, but also the 25% of registered voters who simply abstained from voting. Turnout dropped from 83.6% in the 2006 elections and 80.5% in the 2008 elections to just 75.2% in the 2013 elections. Photo credit to Kevin Lees — SAIS, Washington DC, , March 2013. Previous PostThe latest on Kenya’s election results: IEBC targets Friday finaleNext PostShould Capriles automatically get a second shot at Venezuela’s presidency?